Our counter stools are second to none. These stools have been using the same cast iron components for over 30 years. Each stool comes with a cast iron bushing, cast iron threads, and a cast iron bell. These units are built to last and last. We can customize your counter stool with a number of different column and bell finishes. We can do any height between 18 and 30 inches. Is your counter a few inches too low? No problem! Interested in adding a footrest to your counter stool? We use a heavy duty cast aluminum footrest. Cast aluminum is much more durable than the typical chrome plated steel footrest. 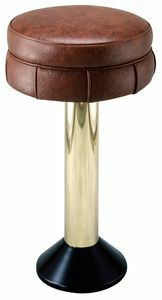 In addition, our footrest encircles the entire base of the stool making the footrest a permanent addition to your stool. Each counter stool comes with a special floor attachment made for your specific installation. Please specify Type A, Type B, or Type C floor attachment when ordering. These round seat counter stools come with a custom machined 360 swivel. Our Soda Fountain Stools are manufactured in the USA. For more details, please send us an email or give us a call.